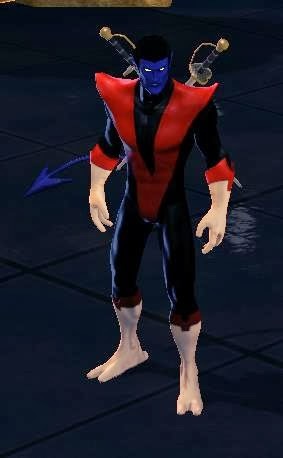 Dr Jengo's World: Marvel Heroes Diary: Feb 2 2014 - Enter Nightcrawler! Marvel Heroes Diary: Feb 2 2014 - Enter Nightcrawler! The first hero of the Advanced Pack dropped a couple of days back together with the patch that brought the Lunar New Year Celebrations. Nightcrawler leads the way, with Dr. Strange and Moon Knight coming in the next few months. 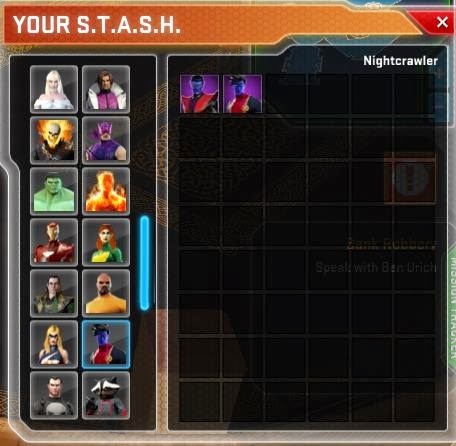 Since I got the Advanced Pack, I got Nightcrawler with his first 2 costumes. 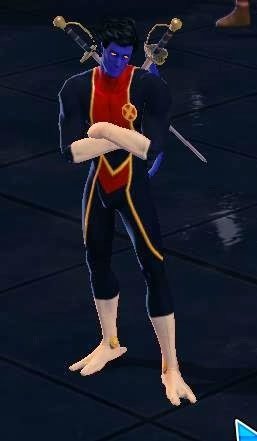 I definitely prefer the classic costume as it looks more accurate to the X-Men cartoon shows from the 90s. No doubt I will be playing him in in his classic outfit more often that not. Also in the bundle was his stash. This is something that is a must for me. Where else would I put my extra costumes and other stuff? Just a little obsession that I have, where I feel "complete" only if the hero has his own hero stash. Notice Loki's hero stash is unlocked even though I purchased him with Eternity Splinters. and of course 2 retcon devices included as well.. Very important for my play-style.. With the new 52-build, I'd like to re-spec my hero once at level 30 and again at level 60. Of course, I never know when I need more of these, so the ones I get from the missions may also come in handy. I haven't gotten to trying him yet but his play-style looks to be very unique. His teleportation powers gonna be a blast and will probably be a main part of my build. Will probably mix up the rest with his acrobatic and sword powers. Planning to complete some of my other goals before I try him. Hopefully, that won't take too long.. Here's a trailer of Nightcrawler in action! Check out the rest of my Marvel Heroes Diary entries!